Steve Cartwright is working as System administrator at Universal Containers (UC). He has received a requirement to Automatically Sync accepted Quote with Opportunity because business users always forget to Sync accepted Quote with Opportunity and it creates problems in reporting. There are multiple solutions possible for the above business scenario. You can either use Apex trigger, a combination of Flow and Inline Visualforce Page, and few more. We will use Flow and Process Builder to solve the above business requirement. Before starting the Implementation, you have to understand one important concept related to the Sync Quote feature. There is a field on Opportunity object i.e. Synced Quote, It’s nothing but a Lookup of the Quote Object. To automate Quote Sync Process, you have to populate the value in this field. Likewise, create one more Text variable VarT_OpportunityId to pass the Opportunity Id. 6. Don’t forget to Activate the Flow. Now onwards if a business user updates the Quote Status to Accepted, Process Builder will automatically Sync Accepted Quote with Opportunity. Note: -I will suggest you to Implement this first on your developer org test it and then move it to Production. Is it possible to use process builder and flow to sync custom fields from the qli and quote to the opp products and opportunity and vice versa? There is a package on the app exchange that does this however it is not lightning compatible. Yes if you able to write the logic then it should work. Thank Rakesh. A quick query. Why can’t i use “Select a record related to the Quote” option in place of flow to update SyncQuoteId? At the time of writing this blog, it was not available. Hello Rakesh, great work really helpful. I am having a small issue and was hoping you could guide me to the right direction. So i implemented what you shared with a minor change to the process builder to trigger when the custom checkbox is checked. This checkbox is autochecked by the approval process once the quote gets approved but for some reason the Process builder or the flow do not execute to autosync. If i check the checkbox manually ti works fine. Any recommendations? Is there way to stop sync automatically when status is changed from accepted to any other value? Any suggestions on what the issue is? I’m having the same problem (quote gets created without products) and I was wondering if you were able to to solve this? This is exactly what I was looking for thank you! It works, except the quote gets created without products. Would I be able to use this use case to sync the quote and opportunity products for the newly created quote? 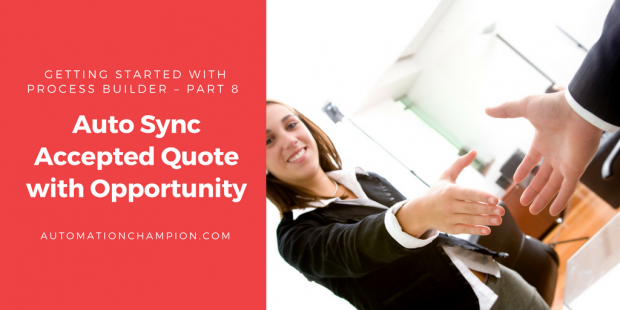 If there are no quote line items in the quote, then after sync all opportunity products will be deleted. With a process builder or will I need to also create a flow? I created a process builder but am having trouble finding the correct related object to update in the action. I think you have to use Flow and Process Builder both. Thanks for the great examples. I implemented and tested it… works great. But when I change the status of quote from ‘Acccepted’ to let’s say ‘In Review’ the sync should stop. How would I extend the above example to implement this. You can add one more criteria node in your Process (Let’s say Status Is changed ‘In Review’) and update flag to False.